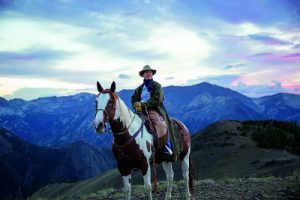 Hells Canyon Scenic Byway lets you leave the fast pace and fenced-in views of Interstate 84 and follow the contours of the land into slower times and wilder places. Jour ney from river’s edge to mountaintop and down to valley floor. Have lunch overlooking a wild and scenic river; share a canyon road with a cattle drive. Pass through lush valleys, rimmed by the snow-tipped Wallowa Mountains. Savor the scent of pine on the fresh mountain air and enjoy panoramic views of rugged basalt cliffs and grassy open ridges. Stand next to the majestic Snake River as it begins its tumbling course through North America’s deepest canyon, or ride the rapids on a raft or jetboat. Use this website to help plan your Hells Canyon byway adventure. Information: The route of the Hells Canyon Scenic Byway is a loop that encircles the Wallowa Mountains of NE Oregon, intersecting with Interstate 84 at La Grande and Baker City. Small towns, scattered along the drive, offer visitor services. The entire route is on a paved highway. Plan ahead – you’ll find stretches of more than eighty miles without gas and with few services. A segment of the Byway between Joseph and Halfway closes with snow during the long winter, but allows access to winter recreation areas, offering a whole other kind of Northeast Oregon Adventure. Length: 218 miles byway proper; with side trips, 400 miles. Visitor Services & Amenities: The Hells Canyon Scenic Byway travels through eleven communities. Each offers a variety of shopping, dining and lodging opportunities. You will find everything from bronze foundries and fine art galleries, to quaint general stores, to major discount markets at the anchor communities. If you enjoy outstanding Northwest cuisine and award-winning Bed & Breakfast Inns – you will find them on the byway. If you want fast food and budget accommodations – you will find them. If your place is under the stars, with potatoes and sausage fried over a campfire – this byway is for you! Recreation: This byway is an outdoor enthusiast’s playground. You can ride a tramway to the top of the mountain for eye-popping views. You can fish in cold clear rivers, hike through dramatic canyon country or alpine forests. In winter, downhill or cross-country ski, or ride a snow mobile on a section of the byway that closes to automobiles for winter (FS Road 39). Camp, raft, ride horses, water ski, hang glide! The choices are endless and the fun is non-stop. Click here to link to the Interactive, Google Map.